Master the basics of music and music notation quickly, effortlessly and simply whatever your age with this playful learning game! Hello music lovers! I am Barbara Swetina, an enthusiastic musician who plays seven different instruments. Yet in spite of these abilities, my musical career was blocked in my younger years, because I could not read music. Fortunately I found a way to read music well and noticed the problem lay not with my abilities but with the system of teaching. Successfully overcoming my learning difficulty gave me the incentive to develop a new and playful learning game, called the MusicTrain. It makes reading music fun and as easy as child's play. The MusicTrain method can teach the basics of music and music notation quickly, effortlessly and simply, within just one hour. It is easy to understand and so much fun, that learning is easy and there is no stress. Failure is impossible because the learning curve is customised to individual needs. MusicTrain is a holistic method that works with image analogies and stories. It activates and links parts of the brain through creative play with with game boards and tokens as well as with voice, movement and instruments. This is an excellent basis for increasing brain performance and enhancing cognitive abilities in young and old. The MusicTrain works in schools, families, music schools and therapy sessions and works for groups, individual lessons and self-study. 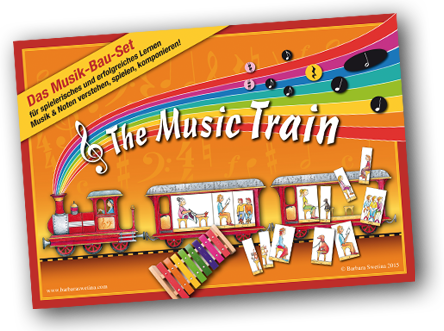 The Music Train is available to purchase as a box set, (though not available for distribution in the UK at present). Video in German with English subtitles.